Simple daily habits that give health, balance, and joy to our everyday lives, by linking us to the larger rhythms of the planet and to the vital bedrock of existence. Introducing the practical wisdom of China's folk culture to modern America. "A heartening, inspiring, timely book on the art of living." "Raymond Barnett's superb book brings ancient wisdom from the East to the challenge of living well in the West--even in the midst of accelerating change, technological dominance, and overchoice." "A most unusual self-help book: a breezy and useful guide to more healthful living; an enlightening introduction to everyday Chinese life and Taoism; and, in its most touching aspect, an account of how Barnett used Taoist practices to help himself and his family overcome a great personal loss." One of the chapters of Relax, You're Already Home was deleted from the published book by the editors at Tarcher/Penguin Publishing. In their view, this chapter treating the relationship between Taoism and modern biological science was too technical and esoteric for general readers. I reluctantly acquiesced. But in the meantime, many readers have expressed to me a desire to know more about--just that! For all of you who are intrigued by how ancient Chinese Taoism relates to modern Western science--here 'tis the "forbidden chapter"! You may be curious as to how Taoism relates to science, since science is the underpinning of so much of our modern life in America. If you find these Taoist habits fitting nicely into your life, you may guess that Taoism and science at least are not antagonistic, despite their very different origins. And you'd be right. In fact, and surprisingly, we'll find that Taoism and science have a lot in common. Although yes, there are differences. First, the similarities. As we saw in the first several chapters, the ideas of Tao and Qi are fundamental. Tao. In Taoism, Tao is the pattern of existence, the path that is revealed in the dance between matter and energy. Tao confers the inherent property of each phenomenon in the cosmos. Okakura describes Tao as "the mood of the universe" in his The Book of Tea. Tao is also the process generating the patterns that we see, the dynamic generating "things as they are." The Tao is characterized by order, by harmony, by pattern. The Tao of the cosmos permits the evolution of life and is supportive of life, although life is nothing special, simply another aspect of the unfolding of the Tao. To my mind, the central finding of the scientific enterprise of the West of the last two hundred years is that reality has an order and a pattern to it. The scientific enterprise is the discovery of the order in the universe, and the description of that order in quantified, mathematical models. When that mathematical description is very precise, the relationships are called Laws. Physics and chemistry have succeeded in discovering many laws. When the relationships being described are too complex for precise mathematical description, the relationships are called Theories. Biology has discovered many theories, which are explanations that have been repeatedly subjected to scientific tests without being contradicted. Science also has found that the properties of matter are inherent to matter. That is, the "nature" of reality inheres in that reality's physical properties, rather than being imposed from outside the system. Moreover, matter and energy are linked, and transform back and forth as described in the Laws of Thermodynamics. And finally, science has discovered that life is founded on the same laws and properties as inanimate reality. At the deepest level, life emerges from the same physical properties and interactions among atoms and molecules as characterize rocks, water, and fire. We scientists have not yet succeeded in formulating a "unified theory" of all of reality, either in mathematical or descriptive terms. The concept of "the Tao," however, may quite readily be considered an informal, summative designation of the overarching pattern of order and the process of transformation discovered by science. Scientists do not accept informal formulations not subjected to formal experimental verification, of course, so they cannot admit the Tao into the scientific realm of explanation. Yet it remains true that the Tao is quite consistent with what science has discovered so far about order, pattern, inherent properties, transformative energetic processes, and common properties of life and non-living phenomena. Qi. The energetic medium through which the transformative flow of the Tao is expressed is Qi. The Chinese term Qi can be translated as simply energy, but it has far richer implications, meaning also air, breath, steam, force, strength, and temper. This evocative term, in its various shades of suggestion, perfectly mirrors the manifold flow of the Tao, turning now this way, now that, endlessly transforming. By choosing to express the flow of the Tao in energetic terms, Taoism emphasizes the vital, pulsing nature of the Tao. The manifold aspects of the flow of Qi can be grouped into two grand subsets, the Yin and the Yang. Yin, of course, includes all those energetic states that incorporate the yielding, shady, lunar, earthly, feminine aspects of reality, while Yang includes the aggressive, bright, solar, heavenly, masculine aspects of reality. Most importantly, these two grand subsets or groupings in the flow of Qi are not opposites, but are rather complementary. Each hyperdimensional "patch" in space-time reality is composed of aggregate combinations of yin and yang in its own unique, balanced combination. And the interplay of these patches is characterized by incessant transformation of yin elements to yang and vice versa. Again: Qi flows, transformation is the norm. Those wise in the ways of the flow of Qi claim to discern the paths of flow in mountains and rivers and the human body. Traditional Chinese medicine and acupuncture rely on knowledge of Qi pathways in humans to rectify blockages or perturbations in the harmonious flow of Qi. We find in science a similar emphasis on energetics. The great findings of the Laws of Thermodynamics describe that matter and energy are the two grand states of reality, and that each is constantly transforming into the other (The First Law). The specific quantitative parameters of this universal matter-energy interchange have been worked out, reflecting modern science's emphasis on mathematical formulation. Energy, like Qi's definitions, can exist in many forms, each capable of transforming into the other. Among these states are potential energy, kinetic energy, chemical energy, and nuclear energy. The second in-flow of energy supporting life on the planet is of course the sun, our own star. Solar energy rains upon the earth, and fortunately creatures from several domains and kingdoms of life have developed the ability to capture solar radiation and convert it to life-supporting uses--the process of photosynthesis. Photosynthetic capture of solar energy is widespread over the entire surface of the planet (both marine and terrestrial), with consequent levels of transformation of this biological energy flowing through the upper "trophic levels" (herbivores, carnivores, decomposers) of these ecosystems. As we saw when considering the Tao above, Qi can thus be considered an informal, summative designation of these various energetic flows and transformations mapped out quantitatively and more precisely by modern science. Again like Tao, the term Qi cannot be admitted into customary scientific discourse, but can stand as a surprisingly consonant formulation that incorporates many of the general features of energy flow discovered by science. Humans. Of course, we humans are most interested in our own place on the planet. In the Taoist view, humans are nothing extraordinary. We are simply one of the "ten thousand creatures." We have our own unique characteristics--primarily the complexity of our central nervous system, and our resulting hyper-sensitivity to Qi--but then every creature has its own unique characteristics. This uncompromising refusal to place humans on a pedestal is made clear throughout the Taoist source writings and in the distinctive Taoist approach to life. "Everything has its own nature and its own function," says the Chuang Tze. "Nothing is without nature or function. Consider a small stalk or a great column, a leper or a beauty, things that are great or wicked, perverse, or strong. They are all one in Tao." And elsewhere, the Chuang Tze asks these pointed questions: "If a man sleeps in a damp place, his back will ache and he will be half-paralyzed. But does this happen to eels? If a man lives up in tree, he will tremble with fright. But does this happen to monkeys? Of these three, who knows the right place to live? . . . Mao Chiang and Li Chi are considered beautiful by men. But if fish saw them, they would dive to the bottom of the river. If birds saw them, they would fly off. If deer saw them, they would run away. Of these four, who recognizes real beauty?" Surprisingly enough, our Western science began as a Christian religious enterprise, the description of God's creation. But as the description of the world progressed, it became apparent that the creation differed in key respects from its formulation in the Christian religion. First, the earth was discovered not to be the center of the solar system, much less the universe. Then, most distressing, humans were discovered not to be fundamentally different than the rest of creation. We have no unique stamp of the "image of God" on us. Other creatures think, dream, sing, use language, create and use tools, and honor their dead, scientists have discovered. We humans did not emerge from a distinct creation event, but rather evolved from other apes, following the same rules in the same manner as every other plant and animal species has evolved from its ancestors. The blood in our veins is salty because our distant ancestors originated in the same primeval oceans as every other descendant of those ancestors. Our DNA uses the same nucleotides and the same genetic code as bacteria, redwoods, banana slugs, and every other creature on the planet. These and other findings make it very clear that the scientific view of the place of humans in the natural world is completely consonant with the Taoist outlook. So we see that the fundamental ideas of Tao, Qi, and the place of humans are strikingly similar in Taoism and science. The similarities don't stop there. Let's briefly consider a few more. Reversion. According to Taoists, the world works in cycles with things returning (reverting) sooner or later to the beginning point. "The ten thousand things rise and fall while the self watches their return," says the Tao Te Ching. "They grow and flourish and then return to the source. Returning to the source is the way of stillness, which is the way of nature." Elsewhere, Lao Tze writes that "Returning is the motion of the Tao." Ecologists have determined that the elements present on the planet pass through a cyclic system of movements. Nitrogen, for example, passes from soil to plants to animals and, through decay, back to soil in a well-studied cycle (which is actually two linked cyclical processes, since the element may flow from the atmosphere to the soil, and then back to the atmosphere from the soil, due to the action of microorganisms). This nitrogen cycle operates relatively smoothly and functions by means of the activity of a host of living creatures (from bacteria to carnivores) and organic chemical processes. The early Taoists were well aware of certain aspects of this nitrogen cycle, for we read in the Tao Te Ching that "when the Tao is present in the Universe, the horses haul manure." That is, humans are participating in the grand cycling movement typical of the Tao by loading manure (human and animal) onto carts in the city and having horses haul it back to the countryside, to be put into the fields and its constituents subsequently reincorporated into crops. Complementarity. As noted above in the discussion of Qi, Taoists (and many other outlooks in China) view reality as being composed of processes and phenomena that can generally be grouped into two great camps, yin and yang. The key point is that yin and yang are not opposed to each other. Rather, yin and yang are complementary; they balance each other. Indeed, they are both necessary components of the whole, as illustrated in the well-known "yin-yang" model of two interlocking curved shapes. This outlook contrasts with our typical Western outlook, which sees "opposites" as being starkly different, and antagonistic to each other. Think of our common views of good versus evil, male versus female, love versus hate, black versus white. We biologists often find we can best describe natural processes in terms of two interacting systems, which frequently possess similarities to the yin-yang model. One example is the sympathetic and parasympathetic subsets of the autonomic nervous system studied by neurophysiologists. Ecologists speak of the evolution of organisms being governed by r-selection or by k-selection, that is, selection for competitive ability (surely a yang trait) or for productivity (clearly a yin trait). Selection pressures may change, and a k-selected species may transform to an r-selected "strategy," just as Taoists see yin and yang constantly transforming into each other. Biopsychologists have discovered that the human cerebrum functions as two interconnected halves. The left half specializes in sequential, analytical thought processes, language, and time processing (surely yang activities). The right half specializes in Gestalt-type, intuitive thought processes, art, music, and spatial processing (clearly yin activities). Several psychologists, most notably Robert E. Ornstein, have commented on the remarkable parallels between these cerebral specializations and the yin-yang model. In many areas of biological research, we scientists have learned how fruitless an "either-or" approach can be, in which one explanation must be correct to the exclusion of another. Instead, persuaded by experimental evidence, we frequently have been forced to adopt the yin-yang sort of view, in which various explanations are viewed not as opposed and exclusive, but rather as complementary. The "nature-nurture" debate is one example, as is the controversy among ecologists whether competition or predation structures biological communities. Long-distance navigational abilities by birds is yet another example. Death. Taoists view death as an integral part of the natural process, not as an unnatural event, or an enemy of life. "Life arises from death, and death from life," the Chuang Tze claims. Elsewhere, Lao Tze advises a cripple who has just been rebuffed by Confucius, "Why don't you simply make him (Confucius) see that life and death are one thread, the same line viewed from different sides--and thus free him from his cuffs and fetters." We biologists too view death as an essential part of the process of organic change that includes life. Without death, new life and new life forms could not occur. Those who study biogeochemical cycles find that death and the subsequent decay of organisms are prerequisite to recycling the elements necessary for new life to arise. We have already seen how nitrogen revolves from life to decay to the soil and back to life again in a perpetual cycle. Life arises from death, and death from life. This view of the role of death in natural processes, of course, affects one's view of human death. The Taoists refused to view death as a calamity, unlike the Confucians, or even to fear death. Death was simply another transformation, and transformation is part of the Tao. Some Taoist texts indicate plainly that they were not sure what happened after death, but they certainly were not going to dread it. "How can I tell if love of life is not a delusion," says the Chuang Tze. "How can I tell whether a man who fears death is not like a man who has left home and dreads returning? Lady Li was the daughter of a border guard of Ai. When the Duke of Chin first took her captive, she wept until her dress was soaked with tears. But once she was living in the Duke's palace, sharing his bed, and eating delicious food, she wondered why she had ever cried. How can I tell whether the dead are not amazed that they ever clung to life?" In other instances, the Taoists simply seem to accept death as the end of one's existence as a personality. Note that this calm acceptance of the cessation of one's existence is not predicated on an afterlife, as in the transcendental Christian or Muslim traditions. "The true man of old knew nothing about loving life or hating death," says the Chuang Tze. "When he was born, he felt no elation. When he entered death, there was no sorrow. Carefree he went. Carefree he came. That was all. . . He accepted what was given with delight, and when it was gone, he gave it no more thought." Although it is my experience that we scientists likewise seem to be divided on our approach to human death, it seems safe to say that the majority of us either accept death as the end of one's personality, or simply confess ignorance as to what happens. Basis for similarities. Why these similarities between modern Western science and the ancient Chinese outlook of Taoism? The Tao Te Ching itself gives us the answer. "How do I know the universe is like this?" it asks. The answer follows directly: "By looking!" Here we see the root of the similarities: the methods employed by each are the same. We scientists base our knowledge on careful observation of the natural world. Even in the experimental method, I am observing a situation in which (hopefully!) only one variable has changed. And now we see that the Taoists also arrive at their outlook on the universe by observing it, indeed observing it with a clear, unfettered mind. "There is nothing like using restraint. Restraint begins with giving up one's own ideas," says the Tao Te Ching. The Taoists of traditional China were people of the woods and mountains, and the urban gardens and parks. They spent a great deal of time simply sitting by streams or wandering through forests. Chinese landscape painting has pictured them over many centuries of superb paintings, quietly and attentively observing streams from a hut, or walking with a sharp eye and ear among groves of trees or bamboo: in nature, and alert to its features. Because Taoists knew the natural world intimately, nature metaphors and examples abound in the Tao Te Ching and the Chuang Tse. Just as Taoism and science share a common way of gathering information upon which to build a view of reality, so they also share a common ultimate source of knowledge. In cases of contrasting views, the deciding judgment comes not from a book, nor from a person, nor from a supernatural being's revelations. The final arbiter is the phenomenon itself. The scientist goes back to the field, or back to the bench, and looks at the phenomenon again, using perhaps a new stain or new experiment. The Taoist goes back to the natural world and patiently, calmly watches the flow of the stream and the steady progression of seasonal changes. Reality itself, carefully observed, is the source of knowledge and the final arbiter in both these systems. "How do I know the universe is like this? By looking!" Differences. It is important to admit, however, that even though there are fundamental similarities between Taoism and science, there are also some clear differences. Some of these ways in which the two differ are important. Verbal argument. Taoists dislike argument and mistrust people with verbal facility. "Those who know do not talk. Those who talk do not know," the Tao Te Ching says. "Truthful words are not beautiful. Beautiful words are not truthful. Good men do not argue. Those who argue are not good," it says elsewhere. Most of us scientists, on the other hand, relish spirited exchange of opinions, either verbally or in print. We use the "peer review" system to judge grant requests and articles for publication. The most interesting section of scientific journals is the "Notes" section, containing critical comments on previously published articles. It is out of this climate of (sometimes unbridled) criticism of each other's ideas that scientific advances occur. Machines. Taoists also dislike machines and harbor deep suspicions of those who use machines. The Tao Te Ching describes the ideal country as follows. "A small country has fewer people. Though there are machines that can work ten to a hundred times faster than man, they are not needed. . . Though there are boats and carriages, no one uses them. . . Men return to the knotting of rope in place of writing." Needless to say, this aversion to machines is absent in science, where machines are seen as boons to expand our range of observations. Indeed, it is impossible to conceive of modern science independent of the array of microscopes, oscilloscopes, spectrophotometers, centrifuges, calorimeters, and myriad other instruments which have opened up worlds of observation and modes of quantification virtually closed without them. To a large degree, the story of modern science is the story of the invention of the machines used in its investigations. Experiments. Another very important difference is in the area of experimentation. Although it is true that objective observation is the crux of science, the most powerful use of this act is when the observation of one situation is compared with the observation of another situation identical to the first except in one respect--that one respect being the experimental (or independent) variable. By thus manipulating the phenomenon under observation, the effect of the variable may be induced. That's the crux of the way we scientists operate. In Taoism, on the other hand, there is no mention of the experimental method, much less an expressed understanding of its power in the discovery and description of natural processes. Indeed, there is an unmistakable sense of distaste for human manipulation of the natural world. "Do you think you can take over the universe and improve it? I do not believe it can be done. The universe is sacred. You cannot improve it. If you try to change it, you will ruin it. If you try to hold it, you will lose it" (Tao Te Ching). When they express this view, Taoists are not thinking only of the efforts of evil, manipulative humans to change and control the world for their own selfish profit. The honest, sincere, goodly efforts of humans to improve the world are just as distasteful to Taoists. In the Taoist way of viewing reality, the world is just right just as it is. Any attempt to force it into some other configuration inevitably sullies it, regardless of the motive. Accept, accept, accept. That's the Taoist way. Similarities in perspective. It remains to emphasize that the fundamental similarities we have noted between Taoism and modern science are just that--similarities, not identities. I am not arguing that Taoists have always known everything that science has arrived at in the past two centuries. Thousands of years ago, Taoists knew that cycles were common and important in natural systems. They did not know that the element nitrogen occurs in the atmosphere, that it is fixed into nitrate by microorganisms in the soil, and that plants take it up in this form and combine it with hydrogen and carbon atoms to form protein molecules. Taoism has known from its earliest days that that humans possess two aspects to their personalities, one assertive, rational, and verbal, the other receptive, intuitive, and nonverbal. They did not know that the former set of properties are primarily processed by the left cerebral hemisphere, the latter by the right. Nor did they know that the brain is composed of millions of neurons which communicate with each other by means of chemicals crossing gaps between the cells. Taoists saw thousands of years ago that life forms on this planet were endlessly transforming and had arisen from a common ancestral origin. They did not know that differential reproductive fitness resulting from natural selection powered these evolutionary changes, nor did they wonder whether the changes occurred mainly by the gradual accumulation of minor changes (a la neo-Darwinism) or by sudden major changes (a la punctuated equilibrium). Even with these caveats in mind, it is nothing short of remarkable to find, across a seemingly vast chasm of separating time, culture, and outlook, the degree of essential similarities between the ancient outlook of Taoism and the modern scientific enterprise. This set of similarities argues strongly for a fundamental continuity of mental processes within the human mind, as well as for a fundamental continuity in the structure of reality. The early Taoists, lacking an appreciation for mathematical models and the systematic use of experiments (except perhaps in the alchemy movement), did nonetheless come a surprisingly long way toward certain aspects of modern science by adhering to the cornerstone of that science--careful, objective observation of the natural world. These considerations are reflected in the findings of the noted English biochemist, sinologist, and historian of science Joseph Needham, who showed by careful scholarship that Taoism was the fertile ground out of which early science arose in China, and led early science in the West for the first fourteen centuries A.D.--but that's another story. You may be interested in pursuing this fascinating story in his massive, multi-volume Science and Civilization in China, begun in 1956, or (much easier reading!) in his 1981 summary, Science and Traditional China. The wonder of it all is how far the early Taoists did come merely by observation, and doubtless by sharp, informed intuition proceeding out of that observation. When generations hence look back on our science of today, they will doubtless wonder at our ignorance and the incompleteness of what we thought we knew. We can only hope that some few among them in that future day will be intelligent and fair enough to realize that, for all our shortcomings, we are doing our best to make sense out of our existence in a strange and beautiful world, in a way that respects the integrity and reality of that world. Just as were the early Taoists so long ago, and so far away from us today. An early version of the above thoughts was published in 1986 in Zygon, vol. 21, no. 3, pp. 297-317. What do you think: can the world's oldest continuous civilization have anything to say to the world's youngest? China's culture--its everyday habits of life and the values they embody--is more than 5,000 years old. America's is less than 500. The Chinese "way of life" wears well. Because it works so well, it retains its characteristic stamp wherever it's transplanted around the world. Molded by the ancient native outlook of Taoism, China's people practice a way of living their everyday life that is robust, cohesive, and above all successful. It is the flourishing constant underlying the changing superstructures of empire, republic, warlords, and now communism. Can we in America learn anything from this old and fabulously successful way of living life? Do we have any need for a different approach to life? In my home state of California, there're more people in prison than in college. The state Legislature and our Governor regularly transform problems into crises, with the cost passed straight to citizens like you and me. Big business and big labor alike buy special consideration. Money talks, and how. On the national scene, you can't help but notice that the spasm of unity following 9/11 is long gone, and we're as bitterly divided as ever over war and peace, racism, the economy versus the environment, and how we should raise and educate our kids. All this confusion and strife isn't confined to the public sphere, unfortunately. It's amply reflected in our private lives. Whether our jobs and relationships are steady or constantly changing, we all ask the same questions, just below the surface of our busy lives. What's this all about? Am I really happy, or just too busy to confront the fact that my life doesn't have a direction, a purpose? Religion is supposed to answer these questions, of course. But some of us see traditional religions as hopelessly out of touch with the modern, scientific understanding of life. We wander into "New Age" ways of thinking. Others of us reach back to earlier and simpler versions of religion, fueling the contemporary resurgence in fundamentalist branches of Christianity and Islam. And those of us sticking with the religion we were raised in feel too often like we're just going through the motions, and we wonder, deep down, if the old explanations really work for us. Why don't we try thinking really outside the box? Something really weird--but successful! Of course, from our American point of view, that's China. Those 5,000 years of a culture that works so well that it really hasn't changed fundamentally for millenia. A culture that works so well that when its people move to Karachi or London or San Francisco, they take it with them, lock, stock, and barrel, giving the world all those Chinatowns in every corner of the planet. On my first trips to Asia--Vietnam in the late '60s, courtesy of Uncle Sam, then China several times in the early '80s with my travel buddy Kyle-- I immediately noticed how strange these places were, and how the daily lives of the people there had a different "flavor" than I'd ever seen. Since I'd studied the Chinese language while at Yale, and because Kyle is adventuresome and cool-witted, we were able to connect with the people way beyond the typical tourist level. The "different way of living" in China and the surrounding countries fascinated me, and I sought out the common people in little-traveled corners of China and Korea and Taiwan and Japan in subsequent trips. Everywhere I found common people exhibiting a tough acceptance of life, an ability to plunge into both the sweet and the bitter sides of life and savor it. I was struck by a simple, easy-going enjoyment of everyday life evident in many people, a low-key gusto that was at odds with life in much of America. The trite "serenity" that you hear so much about turned out to be true, and not in gurus and hermits, but in many of the common folk I encountered. Between my travels and my study, it became apparent that the ancient Taoist approach to life accounted for much of what I was seeing. Not the Taoism of the advanced Masters, with their dramatic feats of martial arts and exotic breathing techniques, but the Taoism of the common people, the real China. Long described in China as "the art of living," Taoism is the oldest continuous and consistent approach to living on the planet. This Taoist outlook is thoroughly engrained into everyday life in China, so that daily life is permeated by Taoist habits. The accumulation of these simple Taoist habits, it turns out, gives rise to that richer, more vibrant, steadily focused quality of life that I saw throughout China. You can tap into that richer life. Right here in America, today. And you don't have to "go Chinese" and start meditating and practicing vicious high-leg kicks to do it. All you need do is incorporate the simple, everyday Taoist habits into your existing life. I'll get you started in the following pages, and give you lots of suggestions about what has worked for me, my family, and many others. Let's go! The Taoist tradition has given rise to countless everyday habits of the ordinary people of China, habits which contribute to a rich, coherent experience of life. These everyday Taoist habits work just as well for Americans as for Chinese, though. In fact, you and I practice many of them, unaware of what's behind them. Take the view of things I have from my kitchen window here in northern California, for example. As I stare out the window filling the teapot with water first thing every morning, I usually see Julie from across the way coming back from her dawn run. She's beaming, cheeks flushed, walking with a lilt. And most evenings, while doing the dinner dishes in the same spot, I see Jay from the other end of our CoHousing community, arriving home from a brisk stroll in the park with my neighbors George and Judy. They're laughing, and there's a comfortable swagger in their steps. We've all witnessed these scenes. Maybe you're the one doing the jogging or the walking. Why do these particular activities make us feel so good? Why do folks carve time out of their busy days to walk, to jog, to visit a park? The same sort of scenes occur in China, although the details are different. When my buddy Kyle and I first traveled independently in China in 1986, we’d rise before dawn and walk to the nearest park. There, we’d see crowds of people doing the graceful, sweeping moves of Tai Chi Ch'uan, or the violent lunges of kung fu with swords and lances. Some older folks were simply walking deliberately along a course, hands describing circular movements in the chill air. When you survey Chinese art down the ages, you notice how many paintings there are of lone individuals or small groups of friends in the mountains, or in a bamboo grove, or very frequently beside a stream. Usually these folks are playing a friendly board game, or drinking tea, or often just sitting quietly, enjoying the scenery. What’s going on in these traditional activities? Are the Chinese participating in the same sort of experience as the neighbors outside my kitchen window? In China, at least, people do these outdoor activities because the Taoist outlook permeating Chinese culture places a huge premium on humans connecting with the forces inherent in the natural world. This keeps people healthy and happy. Preeminent among these forces that structure and permeate the natural world is the Tao. These folks are connecting with the Tao. Tao (the way, or path, pronounced "dow" and often spelled "Dao") confers the inherent nature of each material and force in the universe. Tao is the backdrop and the impetus for everything that happens, all the myriad processes of transformation that constantly course through the world. In the words of a Japanese scholar, Tao is "the mood of the universe." The flow of Tao gives rise to the patterns and regularities that characterize the universe. Tao courses everywhere, but most clearly in the natural world, where its patterns are strikingly evident, most accessible to human perception and participation. So we humans connect with this most elemental of phenomena by spending time in the natural world, by participating in the flow of life in nature. Activity in nature reminds us of “the way things are,” realigns us with the mood of the universe, the bedrock of existence—of our own existence, as well as everything else. Paramount among Taoist habits for us modern Americans, then, is doing in our society what those Chinese have been doing in theirs for thousands of years: spend time in the natural world. Immersing ourselves in the Tao is the most basic Taoist habit. This is so important to our health, both physical and spiritual, that it should be done on a daily basis. How do we daily immerse ourselves in the Tao in the modern West? Renouncing your job and family and moving to a shack in the woods is not required. (Although some do: see Appendix 1 about NASCAR driver Ward Burton.) Do you have a park or green space reasonably close to your home? Go there, every day if you can. Make it a routine part of your day. If you’re an early person, then early morning is prime. Julie across the way from me knows this. Although she has two energetic youngsters, she manages to be up early every day for her jog through the park, before Richard leaves for his work. We all know the air is fresher, the day more charged with positive potential just after dawn. Prime time to be out in the natural world. If you’re not an early person, then visit the park on your lunch hour, or first thing after school or work. This is Jay , George, and Judy's walk schedule. In general, engaging in some movement among the trees and rocks is best--walking, bicycling, jogging. But just sitting in the natural environment is beneficial, especially near a body of water. We are fortunate here to live just a block from the third largest municipal park in America. All day long, my neighbors stream out of Valley Oaks Village, our CoHousing community. On foot, bicycles, or skates, we head for Bidwell Park. [Insert figure 2] You cannot spend five minutes in our section of the park without encountering a neighbor. We have our favorite corners, our favorite swimming holes, our favorite paths and trees and rocks. You're not close to a park? Or you're not particularly athletic? If you have a bit of dirt around your home, start a garden, either flower or vegetable. Tend it, as much of the year as your climate permits. Mulch it, fertilize it, take deep breaths as you work the soil, drawing into your lungs the delicious dirt smell produced by the millions of Streptomyces bacteria residing there. Start a compost pile if your neighbors will stand it, and recycle your food and lawn wastes. Tending your garden puts you in touch with the flow of the Tao, focuses you on the natural rhythms of the universe. How many of these can you do today? This week? notice the trees and rocks. wade in and explore its rocks and creatures. take a picnic, pick some flowers. feel the dirt, make it richer. No park or dirt nearby? Bring the natural world into your home. Invest in a variety of house plants, and care for them. Learn which of your windows the plants are happiest beside. Which water regimes they thrive on. Which nutrients keep them healthy and luxuriant. Do they need “grow lights” in the winter to stay happy? The Tao flows in electrical appliances, also! What natural object intrigues you when you go for a trip or a walk? Pick it up, bring it home, and put it on your window sill. In our home we have lots of rocks and seashells on shelves and counters as well as window sills. Not just any rocks or seashells, but special ones, rocks spewed from volcanoes in Hawaii, or seashells formed by mollusks that have poison darts to subdue their wormy or fishy prey. Just seeing the rocks and shells there reminds you of how incredible the world is, and how much fun you had when you found them. Visit every park or green space in your town over the next week or month. Describe each one, and the possibilities each one offers for Immersion in the Tao. Visit every body of water in your county over the next month or year. Describe each one, and the possibilities each one offers for Immersion in the Tao. Learn to identify five native trees in your county. Describe their leaf shape, what type of fruit they produce, what birds and insects and mammals you find in them. Buy binoculars and learn ten common birds in your area. What vegetation to they hang out in? What do they eat? What do their calls sound like? 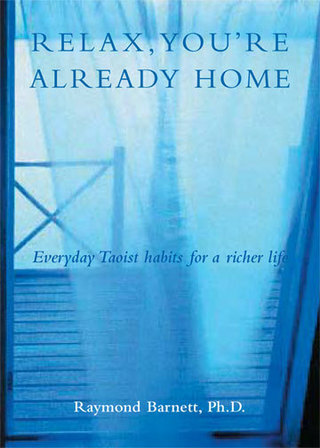 The practice of immersing yourself in the Tao applies to very mundane aspects of your daily life. When I had just graduated from high school, I had a summer job working construction in Tulsa. I rode to work with Dad at 6:45 every morning. Dad had every window in the car down, and since I was wearing a t-shirt appropriate for the hottest part of the day, I was freezing in the early morning coolness. I didn’t say anything—this was the very early 1960’s in Oklahoma, and you didn’t dare say much to your Dad, certainly not a request to change his habits. Dad’s instinct was to have as much fresh air as possible around him. He had grown up on a farm in central Oklahoma, and being outdoors in nature was just second-nature to him, even though he’d traded his tractor for the executive suite of a petroleum supply firm. Like my Dad, open your windows as much as possible. Don’t hide inside your closed home with a heater or air conditioner any more than you have to. In the summers, particularly, we turn the AC off at night, open our windows, and let the universe cool the house down. Do you ever go camping? Incorporate camping trips into your family life. Every summer my wife Tammy and I drive two hour’s north to Lassen Park a time or two with our kids Ash and Lou, and pitch our tent for a long weekend. We’ve always had a large family tent. It's just part of our essential family “tool kit,” like first-aid kits and bicycles and apples always available on the kitchen table. You don't think your family will take to camping? Make it fun. How many matches does dad need to start the fire? Is he allowed to use newspapers as kindling? At what age do your kids get better at making the fire than dad? Which trail are you hiking today? How many “s'mores” can my son Lou gorge himself on tonight? We buy “light sticks,” the plastic tubes containing substances which glow when you break the internal partition separating them, and take them camping with us. Every night we entertain ourselves for hours after settling into our bedrolls in the tent, swirling the glowing containers in different patterns on the end of a string, or bending the long, flexible ones into intriguing shapes. We make butterflies which flutter around the tent, or lumbering Giant Pandas. Then the kids nestle besides the glowing sticks, their own personal lighted guardians through the chilly nights. Don't forget tent and raingear! Why does time in natural environments benefit us, from a scientific view? That's easy to explain. Humans evolved for millions of years on the savannas of Africa. We moved out of Africa into the rest of the Old World, then to the New World, living completely immersed in nature. Sensory input from the natural world is part of our biological heritage, part of what has been incorporated into the normal functioning of our genes, our nervous systems, our guts. When we cut ourselves off from the natural world, our biological systems are adrift, missing key elements of the system of cues they are accustomed to receive. Sensory input from the natural world is so fundamental that, like fish in water, we don't even realize how critical it is. But just look at people living in crowded cities to realize how easily many of us get "off-track" without it, feeling frazzled and off-center, and wondering what's gone wrong. Tiny frogs of the family Dendrobatidae inhabit rainforests in South America. These are the creatures which produce the deadly alkaloid poisons that Cocos Indians rub on their darts to bring down large prey. The alkaloids cause sodium and potassium channels in cell membranes to misfunction. When you capture a Dendrobatid frog and take it to a laboratory in a city, the poor creature ceases producing the poisons that protect it. Why? We can't figure it out. Thought it was the food. Nope. There's something about just living in that rainforest environment that turns on the frog's "poison" genes to express themselves. Perhaps the sounds. Perhaps the smells. Perhaps the whole experience of living in the natural world where it evolved. Remove it from those inputs, and it's missing something. It's "off-center," things aren't "right." You and I are just like these frogs. And so are redwood trees and banana slugs. We all evolved in the natural world. We need it, to stay healthy, to keep our systems functioning well. Take us out of the natural environment, isolate us from the natural world and its flow of Tao, and we suffer. You suffer, and I suffer. Immerse yourself in the Tao. It keeps you centered. Healthier. Happier. More resilient when tough times come. The Tao is the sacred stuff that animates the universe. Cleave to it. Among Heather and Holly's favorite stories when they were young were the Brer Rabbit stories. They especially liked the one about Brer Rabbit's escape from Brer Fox at his "Laughin' Place," an old hickory tree full, as is turned out, of bumble bees. You may find your Laughin' Place at one of the parks in your town. Or you may want to drive out to the countryside or up to the mountains or to the seashore to find it. But you'll know it when you find it. There'll be a "rightness" to its look and feel. A sigh of contentment will bubble out of you as you see it and hear it. Drag a lawn chair out, or buckle into your snowboard, and enjoy it. Visit it often! It's your Laughin' Place. Postscript for families. If you’re single or part of a couple without kids, immersing yourself in the Tao every day is not too difficult. If you’re a parent raising kids, it can be a tremendous challenge just to find the time and opportunity to get yourself in the natural world every day. Get your kids there every day, too? Forget it! I hear you. But the more often you can manage to immerse your kids in the natural world, the healthier they’ll be, too. Don’t be a dictator about it, but do what you can to get those kids away from the television or computer and outside with you. I know it’s not easy. Ash and Lou, my two youngest kids, get “stuck” in front of their computer and favorite videos, like most modern kids. Tammy and I put limits on the amount of “electronic monitor” time the kids can do every day. We prohibit any television at all, which admittedly might be tough for many families, although if you establish the pattern from the get-go, it is surprisingly do-able. But still, it’s sometimes tough to get the kids off their duffs and into the park with us. It usually helps to get a couple of their buddies to come along. Without fail, the kids love it once they get there. When you're in the natural environment with your kids, play some games. Joseph Cornell's Sharing Nature with Children books (1979, and 1989) are fabulous sources of fun things to do with kids in nature. Cornell's activities go beyond "fun" to incorporate an appreciation for the spiritual and other values of activity in the natural world. These books can be thought of as manuals for Taoist living for families.